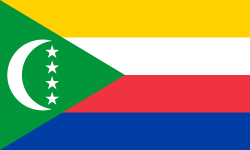 The flag of Comoros was created in 2002. It has four horizontal stripes of yellow, white, red, and blue, with a green chevron based on the hoist side charged with a white crescent and four five-pointed stars. This page was last changed on 24 January 2018, at 14:54.